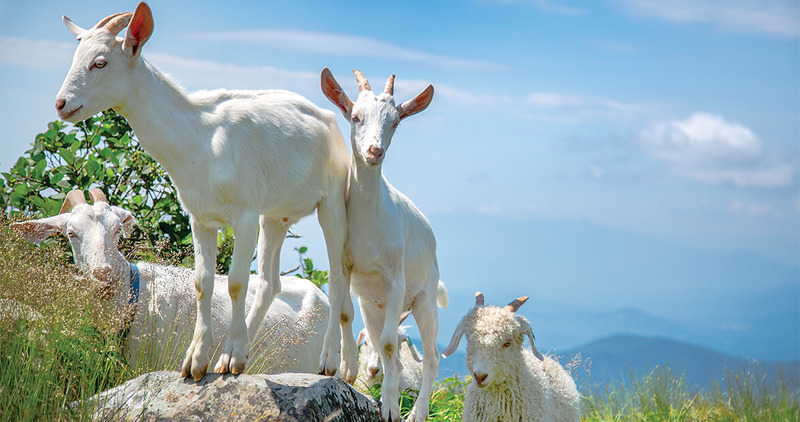 With the help of human herders, some hungry goats are saving the sensitive balds of Roan Mountain. Sixteen goats have gone missing, lost in one of the hardwood forests lining Roan Mountain’s southern Appalachian balds. Treeless and naturally occurring, the balds straddle two national forests: the Cherokee in Tennessee and the Pisgah in North Carolina. The balds existed long before state lines were drawn, but trees are now threatening to close in on them, and potentially destroy entire ecosystems. “This is one of the least studied, most visited plant communities in the world,” says Jamey Donaldson, a botanist and part-time goatherd. In the last 100 years, an estimated 75 percent of Roan’s grassy balds have been lost to the trees. But goats, and their healthy appetites, offer these areas a chance at ecological redemption — if the goats ever come back. Donaldson pulls a container of rocks from his pocket and shakes it, mimicking the sound of corn feed. Apparently, rocks are a paltry incentive compared to acres of leafy greens. No goats. 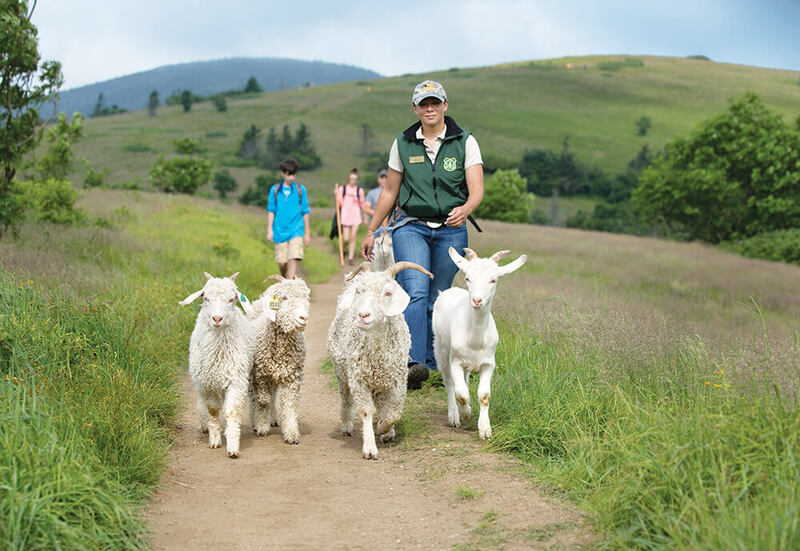 Donaldson, whose white beard matches the Angora goats’ cloud-like fluff, started herding on Roan Mountain in 2008, as part of the Baatany Goat Project, a landscape management program. 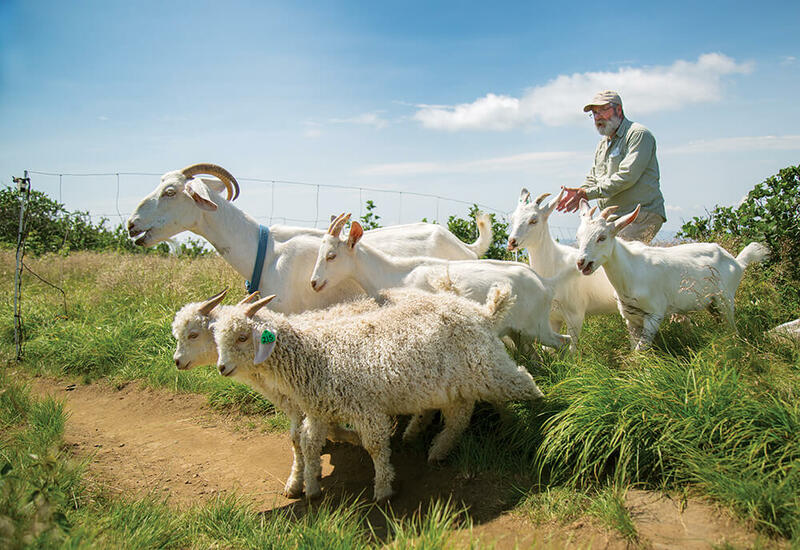 With the support of Todd Eastin — who owns and cares for the herd at his off-mountain farm in cold seasons — Donaldson spends his summers on Roan leading goats to devour hardwood saplings. The goats are fickle, occasionally wandering during the annual herding, Donaldson says, but not in these numbers. However, the goats’ vanishing act, while worrisome, illustrates one of the traits Donaldson appreciates about them: free will. It is free will, after all, that a goat uses to selectively browse invasive and woody species. The trek to Jane Bald started at 8:30 this morning, in knee-high grass. Dozens of volunteers showed up to help Donaldson and Eastin move the goats to their temporary paddock. But the logistics haven’t gone as planned. When the goats initially stepped out of Eastin’s travel trailer, they seemed timid. But goats and humans alike were soon absorbed by the difficulty of making it up the first crest, which is connected to Jane Bald by a slender saddle of land and a section of the Appalachian Trail. The goats emerge into the sunlight … surprised to see humans. The sweet smell of grass and soil intensified as the dew burned off the ground. Hooves and hiking boots crushed soft moss and ambled over hard stone and navigated patches of Canada blackberry — one of the invasive species Baatany would most like to eradicate, and, as it so happens, one of the goats’ favorite snacks. Ba! the kids called. Baaa! the mothers replied. Ba! Baaa! Ba! Baaa! Over and over. Earlier, when the first group of goats bounded into the fenced paddock, the scene was so playful and joyous that volunteers had laughed at the spectacle. But somber news spread quickly: The slower animals had walked too closely to the encroaching woods, and the remaining goats — half of the herd — had bolted for shade. Within minutes, an announcement went out, passed hiker to hiker: If you’re feeling strong enough to stay and help, your efforts would be appreciated. Now, a couple of long-distance hikers pass by on the Appalachian Trail, just a few feet from Donaldson’s paddock. “Keep an eye out for goats!” a Baatany Goat Project volunteer shouts. When the hikers pause to find out what’s going on, they’re gently encouraged to consider becoming volunteers. Starting, preferably, right this minute. Because here, on the Appalachian Trail, goat herding just turned into a serious outdoor adventure. The balds predate European settlement of the area. But their origin story is uncertain. Were these natural anomalies caused by a migration of animal species in warmer periods? Peter Weigl, a biology professor emeritus at Wake Forest University, has suggested that the balds were created thousands of years ago, in part, by climate change, as well as by large animals like mammoths and mastodons, which ate the trees and trampled the ground. After those animals became extinct, the balds were maintained, to a lesser extent, by elk, bison, and deer, and later, by European settlers’ sheep, cattle, and horses. Donaldson thinks there’s probably some truth to all of the theories, but he’s less interested in how the balds got here than he is in helping them thrive. Roan Mountain is home to about 200 species of birds, nearly 800 species of plants, and, according to Donaldson, 27 globally rare plant communities and 80 endangered, threatened, or rare species. With the help of volunteers, Chris Stoehrel of the United States Forest Service herds goats to Jane Bald, where they will graze for the summer. The area is most famous for its lavish patches of rhododendron, among the largest in the world, but it also hosts the Gray’s lily. Discovered on Roan in 1840 by Asa Gray, the flower grows in the mountains of just three states — North Carolina, Virginia, and Tennessee — and has specific needs. If the region’s grassy balds are overtaken by trees and brush, the rare, flame-colored flower might become extinct. Donaldson crosses his arms and quietly surveys the herding-turned-scouting mission from his perch on Jane Bald. Here, breezes whistle through hair grass and angelica, which volunteers refer to as “goat candy.” Donaldson first encountered this view when he was making his own long-distance trek on the Appalachian Trail. He points toward a cluster of green alder lining the path, a large shrub not usually seen in the South. It is far more difficult to herd animals than it is to run mowers, but the goat project has paid off. 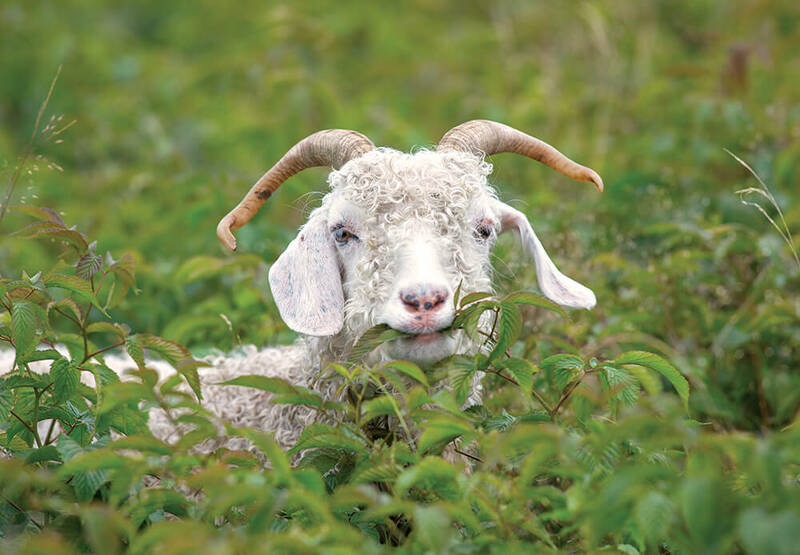 Donaldson’s research — conducted in collaboration with East Tennessee State University — has revealed that goats excel at protecting the green alder, possibly a key species that could be destroyed by mowers and bush hogs, which the U.S. Forest Service uses to clear the balds. Roan’s green alder balds are crucial to the health of this place — and they require a sensitive touch. The touch of goats. The Baatany project rebuts the idea of human influence on the environment as inherently destructive. Through Baatany, the balds are being restored by living beings rather than maintained by motors and metal. In the distance, Eastin’s daughter emerges from the bush. She announces that she’s found the animals lounging near a line of trees. Volunteers cheer, and assemble in herding formation, arms outstretched. Unfortunately, despite the gentle approach, one of the goats gets skittish and races back into the woods. The others aren’t far behind. As quickly as they’d appeared, the wayward goats are gone again. The group falls silent. Worried. Wondering. A few scouts have delved into the understory — a world of gnarled branches and plant life so thick it could easily camouflage the herd. Eastin and Donaldson hope the animals will instinctively fight their way back. Maybe, as the sun sets and the air cools, they’ll come out to search for the rest of the herd, which is already settled on Jane Bald. In the meantime, the sound of baa from the upper paddock is reassuring. Wait, are those calls from the paddock? One of the most attentive volunteers, Saylor Fox, has been working with the goats for two years, and lives on the North Carolina side of Roan Mountain. He emerges from a wooded area he’s been scouting and waves an aluminum hiking stick toward the bramble. Twigs crack. Trees rustle. The goats emerge into the sunlight, blinking, seemingly surprised to see humans. Eastin’s daughter encourages them from behind. When the goats are within a few feet of Eastin, they stall. No one moves for fear of spooking the animals. It’s a standoff: human and goat, hardwood forest and grassy bald. Finally, a toddler, who is on a day hike with his parents, squeals: “Goats!” The animals begin to inch toward their summer paddock. As they walk, a few of them veer into patches of encroaching woodland. They’re herded back to the trail by a forest ranger who’s come out to supervise the operation.